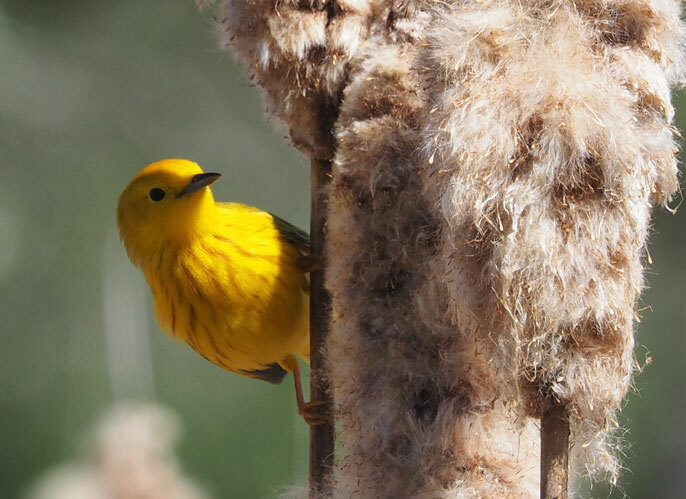 Biologists studied the yellow warbler, which spends its winters in Central and South America, and flies as far north as Alaska and the Arctic Circle in summer. As Earth’s climate changes, species must adapt, shift their geographical ranges or face decline and, in some cases, extinction. Using genetics, UCLA biologists involved in the Bird Genoscape Project are racing against time to find out the potential for adaptation and how best to protect vulnerable populations of birds. UCLA evolutionary biologist Kristen Ruegg, adjunct assistant professor and senior author of the study, said previous studies focused on how long-term changes in temperature and precipitation cause bird species to shift their geographic ranges. Genetic mapping offers the opportunity to look at another option — the capacity to adapt to climate change. “With this research, we can say ‘based on these gene-environment correlations, here’s how populations will have to adapt to future climate change. And here are the populations that have to adapt most,’” said Ruegg, who also is co-director of the Bird Genoscape Project.